In this article, we will show you, How to write a C Program to find Sum of Even and Odd Numbers from 1 to n with an example. TIP: We already explained the logic to check whether the given is Even or Not in C Program to Check Odd or Even article. I suggest you refer the same. 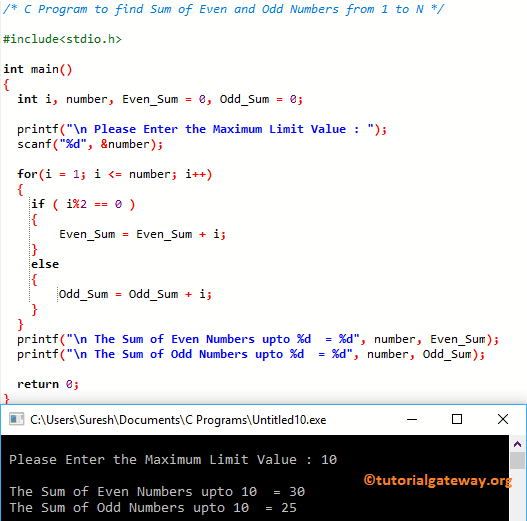 Within this c program to find sum of even and odd numbers example, For Loop will make sure that the number is between 1 and maximum limit value. Any number that is divisible by 2 is Even number. If the condition will check whether the remainder of the number divided by 2 is equal to 0 or not. If the condition is True then it is an Even number, and the compiler will add i value to Even_Sum. If the condition is False then it is an Odd number, the compiler will add i value to Odd_Sum. This program allows the user to enter Minimum, and maximum limit value. Next, the C program calculate the sum of even and odd numbers between Minimum value and maximum value.